We had a scenario-based town attack for our first game, and we have the photo highlights for you! 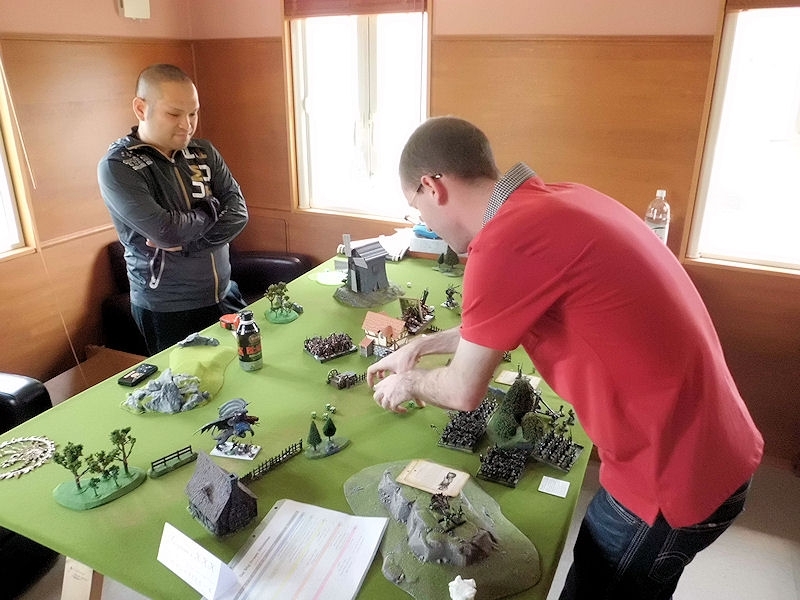 Ross took a small 500 point force of attacking core ogres and knoblars, with the objective of catching and eating 7 or more of the 14 random townspeople scattered throughout the board. Makoto took 500 points of core Empire troops, with archers deployed on the inner castle walls. Chris and David had fun making up silly rules for the townspeople, making blacksmiths and drunks insanely brave and so on. 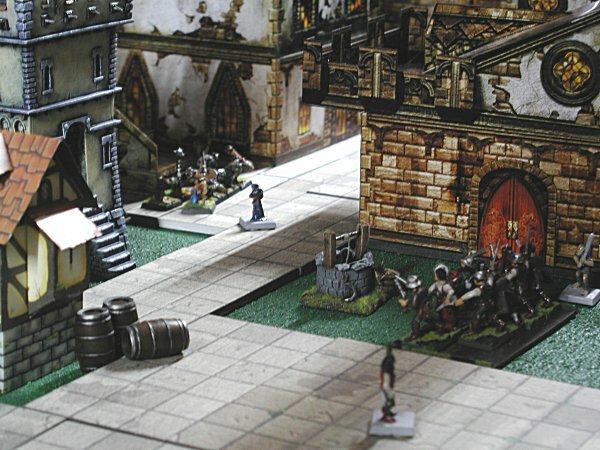 All troops could adopt skirmish formation in and around narrow streets with no penalty. 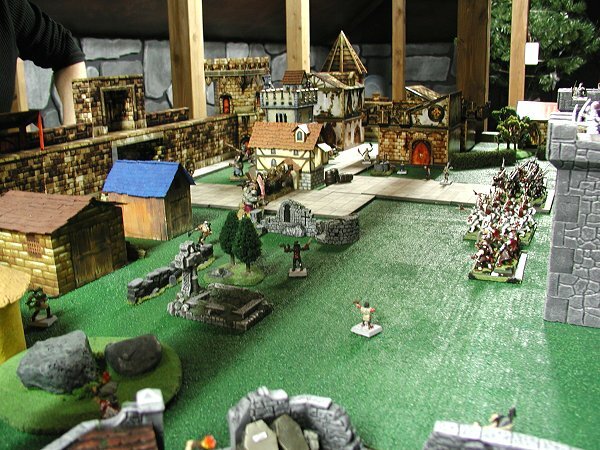 These shots show the initial deployment and first turn, with Empire soldiers lining up in front of their castle and determined to protect the (very stupid) townspeople. You can also see the graveyard and beggars district to the bottom of the photo, where a Gorger appeared on the second turn. 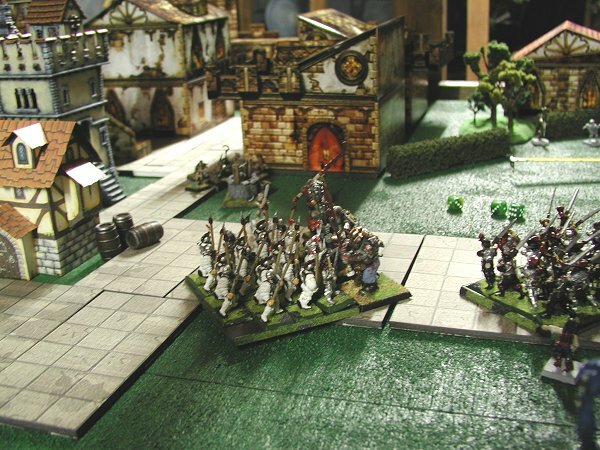 Ross' ogres lined up for a full charge as fast as they could, leaving the capture of villagers to the two small units of knoblar trappers who had dropped down from the town walls. Could they win against such highly-trained troops? 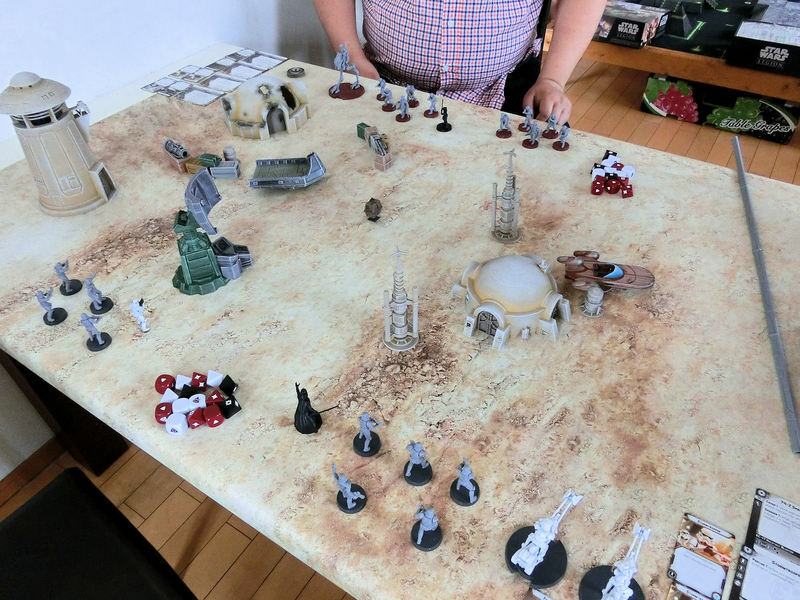 This lady won (wo)man-of-the-match for the Empire side as she stood her ground against 7 angry knoblars, held them by herself, and even managed to slay one of the pesky critters. Watch that rolling-pin fly! Surely a mother-in-law to be proud of?! Sadly for her, the Empire militia were unable to come to her aid in time, and she was knocked unconscious and stuffed in the gnoblars' nets! Perhaps the final combat of the game, when the Empire swordsmen bravely stood their ground against charging Ogre Ironguts. 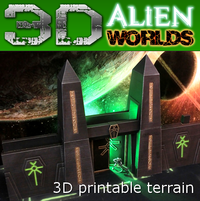 They were battered and chased down, leaving only one intact unit on each side. The Empire archers also deserve a mention, as not only did they slay enough of one ogre bull unit to have them fleeing for the gate, but they also managed to pincushion the sneaky Gorger in a single turn! Then again, I suppose painting him bright blue might have been a mistake...?! The game ended a victory for the ogres, as the knoblars grabbed enough of the townfolk to win the scenario. 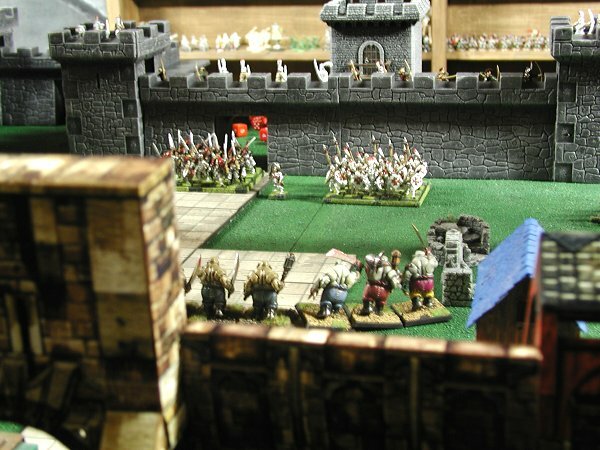 So while the Empire troops shuffled back inside the safety of castle walls, the ogres started work on their post-game BBQ!